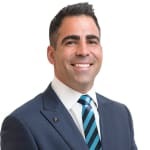 Kosta’s natural flair for connecting with people means that he quickly gets insight into what’s important to you and with his diligent and attentive qualities he strives to give his client unsurpassable customer service. His infectious and charismatic personality developed in his early years in hospitality which now translates to his enthusiastic, high energy and determined attitude in real estate. Kosta Soupionas doesn’t currently have any sold properties on Homely.